November 15, 2016 | Los Angeles, CA – DJI, the world leader in unmanned aerial technology, Tuesday unveiled their soon to be iconic Inspire 2 — DJI’s latest ready-to-fly platform for high-end film and video creators. 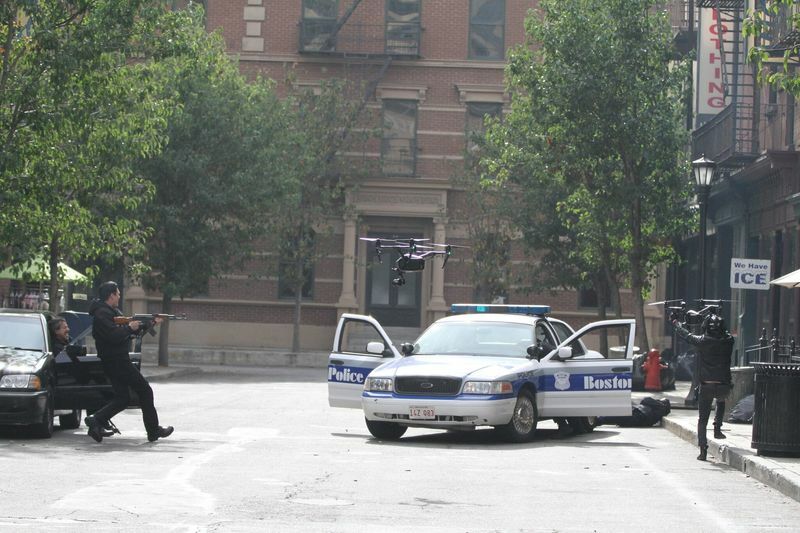 In a live action sequence that took place on a Warner Bros. studio lot, a classic bank heist and street shoot out was captured and relayed live from two Inspire 2s, practically raising the bar for professional imaging in real-time. The 150 strong invite-only audience burst into rapturous applause at the end of the live action scene, which easily showed off the Inspire’s cutting-edge capabilities including ActiveTrack, Spotlight Pro, dual operator control, live HD transmission, and more. DJI’s Director of Strategic Partnerships, Michael Perry, introduced the Phantom 4 Pro, DJI’s smartest creative flying camera in its class. The Inspire 2 keynote followed shortly after, this time given by Paul Pan, Senior Product Manager at DJI. Guests were further captivated with a creative exposé on the potential for drone use in cinema by Academy Award-winning cinematographer Claudio Miranda, whose notable work includes the Life of Pi, Oblivion and Tron. Rounding off the occasion, audience members were invited to watch an exclusive screening of DJI’s new short film, The Circle, starring Ryan Philippe — Cruel Intentions, Flags of Our Fathers — and Noah Schnapp — Bridge of Spies, Stranger Things — about a struggling artist who teaches his son the value of creativity in life. On the theme of creativity, it’s no coincidence that The Circle is shot entirely on an Inspire 2 and the event’s tagline of Control / Create, paid tribute to the Inspire 2’s dual controller abilities and target market of Hollywood filmmakers.